Rehearsal are underway and the room was buzzing with excitement as the artistic team presented our show to the cast of Giovanna d’Arco on Monday night. 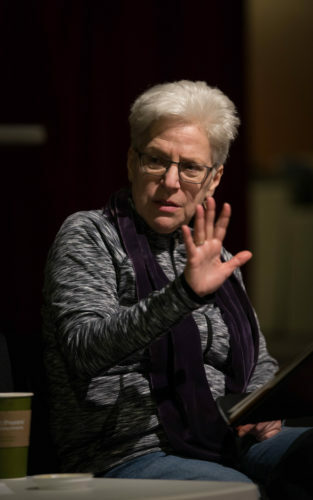 As we embark on this final journey in our season-long exploration of Joan of Arc and the One Hundred Years’ War, we wanted to know a little more about Beth Greenberg, our director, and how she is approaching this telling of Joan’s story. Why is it important to tell this version of Joan’s story? Joan’s larger-than-life story is exactly the kind of tale well-suited to the opera stage, where powerful human voices transcend life’s ordinary experiences. Verdi’s opera takes a great departure from what we know of Joan’s life. The story focuses on her relationship with her father, Giacomo. What sort of research did you do to prepare for this show? I start by discovering the most meaningful, and also visually-compelling image to “define” a show. For Joan’s (Giovanna’s) story, I immediately thought of the mystical voices in her head, voices that she described as accompanied by strong light. This idea has great theatrical value. 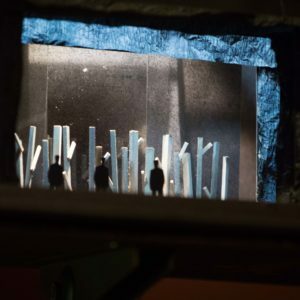 With Dan Daly, our set designer, the first challenge was to figure out how these visions could materialize on stage. We knew we had to develop something very bold and very powerful – something which would have inspired her to lead the French army to victory. Imagine – an illiterate, teenaged farm girl leading a royal army to defeat the formidable English. Has there been something specific in your research or something about the show that is the driving force? We also spoke about the terrible destruction of war. There are two scenes where we see each of the opposing forces – the French and the English – both on the brink of surrender. We developed representations of burnt and destroyed forests and villages for these scenes. Is there anything you found in your research about Joan of Arc or the period you found particularly interesting? It’s always interesting to start with primary historical research. The life of Joan has been well-documented throughout the centuries in both art and literature. The official trial transcripts exist, and it’s of great interest to read Joan’s brilliant and often evasive responses to her inquisitors. This gives great insight into her strong and clear-minded character. Our costume designer, Brooke Stanton, provided historical examples of clothing where we could see the true medieval palette and authentic styles, and also objects like weapons and industrial goods. OK. I will be going; just have to figure out when.